Did you know?? In Chi Chi rugs, the border assumes a much greater importance than the field. The border is composed of a central band enclosed by a series of narrow guards on both sides. The motif used in the central band is found solely in these rugs. The motif used is a kind of hexagon with four short sides that are placed at regular intervals. The space between these is filled with a rosette made up of a star like arrangement of tiny geometric shapes. The field of Chi Chi rugs is decorated with lines of alternating diamonds and octagons which cover the entire area. 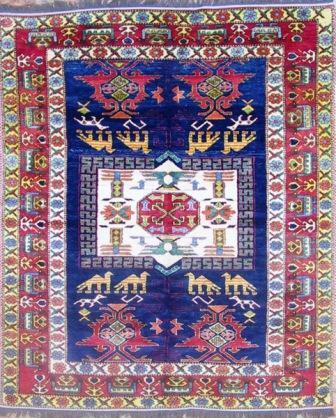 The complex pattern of Chi Chi rugs is heightened by a particularly well-balanced color scheme.